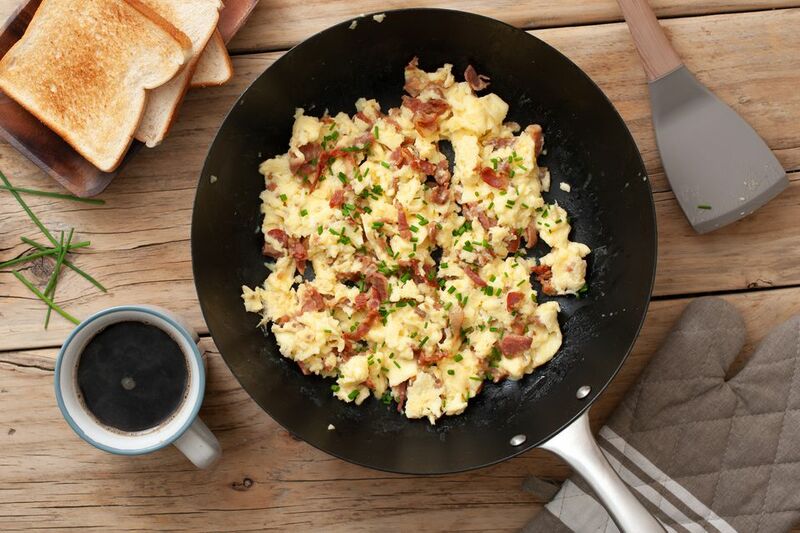 Scrambled eggs with bacon is a versatile recipe. It's an easy everyday breakfast recipe but special enough that you could serve it for a crowd at brunch. You often see scrambled eggs served with bacon, but this recipe has tons of flavor because the scrambled eggs are cooked in some of the bacon fat, then the bacon is folded into the eggs along with cheese. The end result is rich, creamy, salty, and smoky with the wonderful crunch from the bacon. Scrambling eggs isn't difficult, but it does take some practice. To get large fluffy curds of egg, use a heatproof spatula. You will want to occasionally scrape the bottom of the skillet as the eggs cook, turning the eggs over to reveal the cooked area while letting the uncooked egg flow to the bottom of the pan. When the eggs look set, they are done. Don't overcook them. If you want to be safe, the temperature of the cooked eggs should be 160 F as measured by an instant-read thermometer. This recipe can be increased if you are feeding a crowd. Depending on your pan size, you may be able to fit as many as 16 eggs in one pan. It will take longer, but the eggs will be cooked eventually. Watch the pan and don't walk away from the stove. The pan should be scraped often enough so the eggs don't brown on the bottom. It's helpful to use a nonstick skillet for this recipe because eggs stick so easily to nonstick surfaces. Make sure you use a heatproof silicone spatula if you use a nonstick skillet so it doesn't scratch the surface of the pan. If you are making this recipe as part of a brunch for a crowd, serve these eggs with some sweet rolls, muffins, or a coffee cake, and some sweet cold orange juice, hot coffee, and cold milk. A fresh fruit salad is also a nice, light complement to the rich eggs. Cook the bacon until crisp in a large skillet. Use the skillet you will be cooking the eggs in. Drain the bacon on paper towels, crumble, and set aside. Drain all but one tablespoon of bacon fat out of the skillet and do not wash the skillet. In a large bowl, beat the eggs with cream, salt, and pepper. Return the skillet to medium heat and add the butter. Melt butter over medium heat, then add the beaten eggs. Cook the eggs over medium heat, stirring occasionally with a heat-proof spatula, scraping to form large curds until the eggs are almost set. Stir in the cheese and crumbled bacon. Continue cooking until eggs are just set.